This article is about the waterfall on the Zambia/Zimbabwe border. For the town in Zimbabwe, see Victoria Falls, Zimbabwe. For the waterfall in Scotland, see Victoria Falls, Wester Ross. Victoria Falls (Lozi: Mosi-oa-Tunya, "The Smoke that Thunders") is a waterfall in southern Africa on the Zambezi River at the border between Zambia and Zimbabwe. David Livingstone, the Scottish missionary and explorer, is believed to have been the first European to view Victoria Falls on 16 November 1855, from what is now known as Livingstone Island, one of two land masses in the middle of the river, immediately upstream from the falls near the Zambian shore. Livingstone named his discovery in honour of Queen Victoria of Britain, but the indigenous Lozi language name, Mosi-oa-Tunya—"The Smoke That Thunders"—continues in common usage as well. The World Heritage List officially recognizes both names. Livingstone also cites an older name, Seongo or Chongwe, which means "The Place of the Rainbow" as a result of the constant spray. The nearby national park in Zambia is named Mosi-oa-Tunya, whereas the national park and town on the Zimbabwean shore are both named Victoria Falls. Victoria Falls seen from Zimbabwe in July. While it is neither the highest nor the widest waterfall in the world, Victoria Falls is classified as the largest, based on its combined width of 1,708 metres (5,604 ft) and height of 108 metres (354 ft), resulting in the world's largest sheet of falling water. Victoria Falls is roughly twice the height of North America's Niagara Falls and well over twice the width of its Horseshoe Falls. In height and width Victoria Falls is rivalled only by Argentina and Brazil's Iguazu Falls. See table for comparisons. 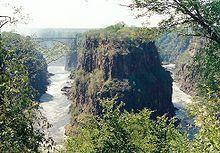 For a considerable distance upstream from the falls, the Zambezi flows over a level sheet of basalt, in a shallow valley, bounded by low and distant sandstone hills. The river's course is dotted with numerous tree-covered islands, which increase in number as the river approaches the falls. There are no mountains, escarpments, or deep valleys; only a flat plateau extending hundreds of kilometres in all directions. The falls are formed as the full width of the river plummets in a single vertical drop into a transverse chasm 1,708 metres (5,604 ft) wide, carved by its waters along a fracture zone in the basalt plateau. The depth of the chasm, called the First Gorge, varies from 80 metres (260 ft) at its western end to 108 metres (354 ft) in the centre. The only outlet to the First Gorge is a 110-metre (360 ft) wide gap about two-thirds of the way across the width of the falls from the western end. The whole volume of the river pours into the Victoria Falls gorges from this narrow cleft. There are two islands on the crest of the falls that are large enough to divide the curtain of water even at full flood: Boaruka Island (or Cataract Island) near the western bank, and Livingstone Island near the middle—the point from which Livingstone first viewed the falls. At less than full flood, additional islets divide the curtain of water into separate parallel streams. 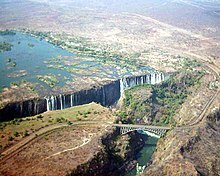 The main streams are named, in order from Zimbabwe (west) to Zambia (east): Devil's Cataract (called Leaping Water by some), Main Falls, Rainbow Falls (the highest) and the Eastern Cataract. The Zambezi river, upstream from the falls, experiences a rainy season from late November to early April, and a dry season the rest of the year. The river's annual flood season is February to May with a peak in April, The spray from the falls typically rises to a height of over 400 metres (1,300 ft), and sometimes even twice as high, and is visible from up to 48 km (30 mi) away. At full moon, a "moonbow" can be seen in the spray instead of the usual daylight rainbow. During the flood season, however, it is impossible to see the foot of the falls and most of its face, and the walks along the cliff opposite it are in a constant shower and shrouded in mist. Close to the edge of the cliff, spray shoots upward like inverted rain, especially at Zambia's Knife-Edge Bridge. As the dry season takes effect, the islets on the crest become wider and more numerous, and in September to January up to half of the rocky face of the falls may become dry and the bottom of the First Gorge can be seen along most of its length. At this time it becomes possible (though not necessarily safe) to walk across some stretches of the river at the crest. It is also possible to walk to the bottom of the First Gorge at the Zimbabwean side. The minimum flow, which occurs in November, is around a tenth of the April figure; this variation in flow is greater than that of other major falls, and causes Victoria Falls' annual average flow rate to be lower than might be expected based on the maximum flow. The entire volume of the Zambezi River pours through the First Gorge's 110 metres (360 ft) wide exit for a distance of about 150 metres (490 ft), then enters a zigzagging series of gorges designated by the order in which the river reaches them. Water entering the Second Gorge makes a sharp right turn and has carved out a deep pool there called the Boiling Pot. Reached via a steep footpath from the Zambian side, it is about 150 metres (500 ft) across. Its surface is smooth at low water, but at high water is marked by enormous, slow swirls and heavy boiling turbulence. Objects and humans that are swept over the falls, including the occasional hippopotamus or crocodile, are frequently found swirling about here or washed up at the north-east end of the Second Gorge. This is where the bodies of Mrs Moss and Mr Orchard, mutilated by crocodiles, were found in 1910 after two canoes were capsized by a hippo at Long Island above the falls. Songwe Gorge: 5.3 kilometres (3.3 mi) south, 3.3 kilometres (2.1 mi) long named after the small Songwe River coming from the north-east, and the deepest at 140 metres (460 ft), the level of the river in them varies by up to 20 metres (66 ft) between wet and dry seasons. The Upper Zambezi River originally drained south through present day Botswana to join the Limpopo River. A general uplift of the land between Zimbabwe and The Kalahari desert about 2 million years ago blocked this drainage route, and a large paleo lake known as Lake Makgadikgadi formed between the Kalahari and the Batoka Basaltic Plateau of Zimbabwe and Zambia. This lake was originally endorheic and had no natural outlet, Under wetter climate conditions about 20,000 years BP, it eventually overflowed and began to drain to the east cutting the Batoka Gorge through the basalt as it went. Satellite image showing the broad Zambezi falling into the narrow cleft and subsequent series of zigzagging gorges (top of picture is north). 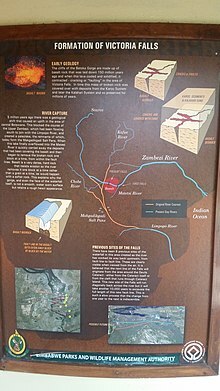 Further geological history of the course of the Zambezi River is in the article of that name. Early Stone Age Acheulean stone artifacts and Oldowan tools were excavated at archaeological sites around the falls, as well as Sangoan tools and Lupemban artifacts dating to the Middle Stone Age. Early Iron Age pottery was excavated at a vlei site near Masuma Dam in the early 1960s. Evidence for iron smelting was also found in a settlement dated to the late 1st millenium AD. The southern Tonga people known as the Batoka/Tokalea called the falls Shungu na mutitima. The Matabele, later arrivals, named them aManz' aThunqayo, and the Batswana and Makololo (whose language is used by the Lozi people) call them Mosi-o-Tunya. All these names mean essentially "the smoke that thunders". A map drawn by Nicolas de Fer in 1715 shows the fall clearly marked in the correct position. It also shows dotted lines denoting trade routes that David Livingstone followed 140 years later. A map from c. 1750 drawn by Jacques Nicolas Bellin for Abbé Antoine François Prevost d'Exiles marks the falls as "cataractes" and notes a settlement to the north of the Zambezi as being friendly with the Portuguese at the time. In November 1855, David Livingstone was the first European who saw the falls, when he traveled from the upper Zambezi to the mouth of the river between 1852 and 1856. The falls were well known to local tribes, and Voortrekker hunters may have known of them, as may the Arabs under a name equivalent to "the end of the world". Europeans were sceptical of their reports, perhaps thinking that the lack of mountains and valleys on the plateau made a large falls unlikely. Livingstone had been told about the falls before he reached them from upriver and was paddled across to a small island that now bears the name Livingstone Island in Zambia. Livingstone had previously been impressed by the Ngonye Falls further upstream, but found the new falls much more impressive, and gave them their English name in honour of Queen Victoria. He wrote of the falls, "No one can imagine the beauty of the view from anything witnessed in England. It had never been seen before by European eyes; but scenes so lovely must have been gazed upon by angels in their flight." In 1860, Livingstone returned to the area and made a detailed study of the falls with John Kirk. Other early European visitors included Portuguese explorer Serpa Pinto, Czech explorer Emil Holub, who made the first detailed plan of the falls and its surroundings in 1875 (published in 1880), and British artist Thomas Baines, who executed some of the earliest paintings of the falls. Until the area was opened up by the building of the railway in 1905, though, the falls were seldom visited by other Europeans. Some writers believe that the Portuguese priest Gonçalo da Silveira was the first European to catch sight of the falls back in the sixteenth century. European settlement of the Victoria Falls area started around 1900 in response to the desire of Cecil Rhodes' British South Africa Company for mineral rights and imperial rule north of the Zambezi, and the exploitation of other natural resources such as timber forests north-east of the falls, and ivory and animal skins. Before 1905, the river was crossed above the falls at the Old Drift, by dugout canoe or a barge towed across with a steel cable. Rhodes' vision of a Cape-Cairo railway drove plans for the first bridge across the Zambezi. He insisted it be built where the spray from the falls would fall on passing trains, so the site at the Second Gorge was chosen. See the main article Victoria Falls Bridge for details. From 1905 the railway offered accessible travel from as far as the Cape in the south and from 1909, as far as the Belgian Congo in the north. In 1904 the Victoria Falls Hotel was opened to accommodate visitors arriving on the new railway. The falls became an increasingly popular attraction during British colonial rule of Northern Rhodesia (Zambia) and Southern Rhodesia (Zimbabwe), with the town of Victoria Falls becoming the main tourist centre. 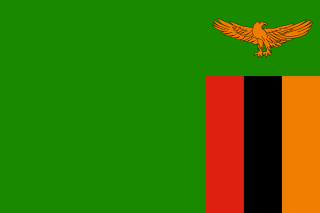 In 1964, Northern Rhodesia became the independent state of Zambia. The following year, Rhodesia unilaterally declared independence. This was not recognized by Zambia, the United Kingdom nor the vast majority of states and led to United Nations-mandated sanctions. In response to the emerging crisis, in 1966 Zambia restricted or stopped border crossings; it did not re-open the border completely until 1980. Guerrilla warfare arose on the southern side of the Zambezi from 1972: the Rhodesian Bush War. Visitor numbers began to drop, particularly on the Rhodesian side. The war affected Zambia through military incursions, causing the latter to impose security measures including the stationing of soldiers to restrict access to the gorges and some parts of the falls. Zimbabwe's internationally recognised independence in 1980 brought comparative peace, and the 1980s witnessed renewed levels of tourism and the development of the region as a centre for adventure sports. Activities that gained popularity in the area include whitewater rafting in the gorges, bungee jumping from the bridge, game fishing, horse riding, kayaking, and flights over the falls. By the end of the 1990s almost 400,000 people were visiting the falls annually, and this was expected to rise to over a million in the next decade. Unlike the game parks, Victoria Falls has more Zimbabwean and Zambian visitors than international tourists; the attraction is accessible by bus and train, and is therefore comparatively inexpensive to reach. Both countries permit tourists to make day trips across the border to view the falls from both viewpoints. Visitors with single-entry visas are required to purchase a visa each time they cross the border; visas can be obtained at both border posts. Costs vary from US$50–$80 (as of January 2017[update]). Visa regulations change frequently; visitors are advised to check the rules currently in effect in both countries before crossing the border in either direction. Additionally, foreign tourists may purchase a KAZA visa for US$50 that will permit visitors to travel between Zambia and Zimbabwe for up to 30 days as long as they remain within the covered countries. A famous feature is the naturally formed "Armchair" (now sometimes called "Devil's Pool"), near the edge of the falls on Livingstone Island on the Zambian side. When the river flow is at a certain level, usually between September and December, a rock barrier forms an eddy with minimal current, allowing adventurous swimmers to splash around in relative safety a few feet from the point where the water cascades over the falls. Occasional deaths have been reported when people have slipped over the rock barrier. The numbers of visitors to the Zimbabwean side of the falls has historically been much higher than the number visiting the Zambia side, due to the greater development of the visitor facilities there. However, the number of tourists visiting Zimbabwe began to decline in the early 2000s as political tensions between supporters and opponents of president Robert Mugabe increased. In 2006, hotel occupancy on the Zimbabwean side hovered at around 30%, while the Zambian side was at near-capacity, with rates in top hotels reaching US$630 per night. The rapid development has prompted the United Nations to consider revoking the Falls' status as a World Heritage Site. In addition, problems of waste disposal and a lack of effective management of the falls' environment are a concern. Two white rhinos at Mosi-oa-Tunya national park in May 2005. They are not indigenous, but were imported from South Africa. The two national parks at the falls are relatively small – Mosi-oa-Tunya National Park is 66 square kilometres (25 sq mi) and Victoria Falls National Park is 23 square kilometres (8.9 sq mi). However, next to the latter on the southern bank is the Zambezi National Park, extending 40 kilometres (25 mi) west along the river. Animals can move between the two Zimbabwean parks and can also reach Matetsi Safari Area, Kazuma Pan National Park and Hwange National Park to the south. On the Zambian side, fences and the outskirts of Livingstone tend to confine most animals to the Mosi-oa-Tunya National Park. In addition fences put up by lodges in response to crime restrict animal movement. In 2004 a separate group of police called the Tourism Police was started. They are commonly seen around the main tourist areas, and can be identified by their uniforms with yellow reflective bibs. Mopane woodland savannah predominates in the area, with smaller areas of miombo and Rhodesian teak woodland and scrubland savannah. Riverine forest with palm trees lines the banks and islands above the falls. The most notable aspect of the area's vegetation though is the rainforest nurtured by the spray from the falls, containing plants rare for the area such as pod mahogany, ebony, ivory palm, wild date palm, batoko plum and a number of creepers and lianas. Vegetation has suffered in recent droughts, and so have the animals that depend on it, particularly antelope. The national parks contain abundant wildlife including sizable populations of elephant, Cape buffalo, giraffe, Grant's zebra, and a variety of antelope. lions, African leopards and South African cheetahs are only occasionally seen. Vervet monkeys and baboons are common. The river above the falls contains large populations of hippopotamus and crocodile. African bush elephants cross the river in the dry season at particular crossing points. Klipspringers, honey badgers, lizards and clawless otters can be glimpsed in the gorges, but they are mainly known for 35 species of raptors. The Taita falcon, black eagle, peregrine falcon and augur buzzard breed there. Above the falls, herons, fish eagles and numerous kinds of waterfowl are common. The river is home to 39 species of fish below the falls and 84 species above it. This illustrates the effectiveness of the falls as a dividing barrier between the upper and lower Zambezi. Notes: See references for explanation of measurements. For water, cubic metres per second = tonnes per second. Half the water approaching Niagara is diverted for hydroelectric power. Iguazu has two drops; height given for biggest drop and total height. 10 falls have greater or equal flow rates, but are not as high as Iguazu and Victoria Falls. ^ "Livingstone Tourism Association, Victoria Falls, Zambia". livingstonetourism.com. Livingstone, Zambia. Retrieved 2018-08-07. ^ a b Wellington, John H. (1955). Southern Africa: A Geographical Study. Vol. 1. Cambridge: University Press. p. 392. ^ "Medium Term Plan (MTP): January 2010 – December 2015" (PDF). Government of Zimbabwe. Archived from the original (PDF) on 29 October 2013. Retrieved 15 May 2013. ^ "Victoria Falls". World Digital Library. 1890–1925. Retrieved 1 June 2013. ^ a b Scheffel, Richard L.; Wernet, Susan J., eds. (1980). Natural Wonders of the World. United States of America: Reader's Digest Association, Inc. pp. 402–403. ISBN 0-89577-087-3. ^ a b c d e World Commission on Dams website: Archived 1 July 2007 at the Wayback Machine "Case Study – Kariba Dam-Zambezi River Basin" Annex 13 & 14 Victoria Falls Mean Monthly Flows. Website accessed 1 March 2007. This website gives mean monthly flow rates in cubic metres per second (i.e., the total volume of water passing in each calendar month divided by the number of seconds in the month), the standard measure used in hydrology to indicate seasonal variation in flow. A figure of around 9,000 m3/s (318,000 cu ft) is quoted by many websites for Victoria Falls but this is the mean maximum instantaneous rate, which is only achieved for a few days per year. The figure of 536 million m3/minute (18.9 billion cu ft/min) on some websites (e.g. ZNTB) is an error for 536 million litres/minute (equivalent to 9100 m3/s or 142 million U.S. gallons/min). The '10-year maximum' is the mean of the maximum monthly rate returned in a ten-year period. ^ a b c d e f g h Spectrum Guide to Zambia. Nairobi: Camerapix Publishers International. 1996. ISBN 978-1-86872-012-5 – via Struik Publishers. ^ "Makgadikgadi Salt Pans". earthobservatory.nasa.gov. 2018. Retrieved 2018-08-16. ^ "Geological history - Botswana Travel Guide". www.botswana-travel-guide.com. Retrieved 2018-08-15. ^ Moore, Andy (2016). Viljoen, Richard; Anhaeusser, Carl; Viljoen, Morris, eds. The Victoria Falls and gorges, in Africa's Top Geological Sites. Cape Town: Struik Nature. pp. 16–20. ISBN 9781775844488. ^ a b c d Moore, Andy; Cotterill, Fenton (2010). "15". In Migon, Piotr. Vicotria Falls: Mosi-oa-Tunya - The Smoke That Thunders, in Geomorphological Landscapes of the World. Springer. p. 147,149. ISBN 9789048130542. ^ Clark, J. D. (1950). "Archaeology". The Stone Age cultures of Northern Rhodesia, with particular Reference to the Cultural and Climatic Succession in the Upper Zambezi Valley and its Tributaries. Cape Town: South African Archaeological Society. pp. 31−131. ^ Robinson, K. R. (1966). "The Iron Age site in Kapula Vlei, near the Masuma Dam, Wankie Game Reserve, Rhodesia". Arnoldia, Rhodesia (239): 1−7. ^ Vogel, J. O. (1975). "Kabondo Kumbo and the Early Iron Age in Victoria Falls region". _Journal of the British Institute in Eastern Africa. 10 (1): 49−75. ^ The Northern Rhodesia Journal online: "Native Name of Victoria Falls", Vol I No 6 p. 68 (1952). Accessed 28 February 2007. ^ The Northern Rhodesia Journal online: "Native Name of Victoria Falls", Vol I No 4 pp. 80–82 (1951). Accessed 28 February 2007. ^ Agter die Magalies": "Agter Die Magalies" B.K. de Beer, pp. 43–44 (1975) Postma Publications. Accessed 1 September 2007. 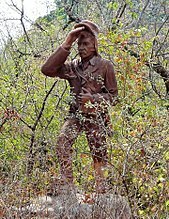 ^ The international service of Czech Radio online: "Statue of explorer Emil Holub unveiled in Livingstone, Zambia" accessed 28 February 2007. ^ Eric Anderson Walker. The Cambridge History of the British Empire, volume 2. CUP Archive, 1963. Retrieved 4 October 2015. ^ a b c d e f United Nations Environment Programme: Protected Areas and World Heritage World Conservation Monitoring Centre. Website accessed 1 March 2007. ^ "Is this the ultimate (and most dangerous) infinity pool in the world?". The Daily Mail. 23 April 2008. Retrieved 22 February 2012. 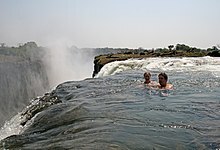 ^ "Tour guide in Vic Falls plunge". New Zimbabwe. 28 September 2009. Archived from the original on 2 March 2012. Retrieved 22 February 2012. ^ "At African Waterfall, Visitors Confront A Tale of Two Cities." Trofimov, Y. The Wall Street Journal. 29 December 2006. ^ a b S Hanyona: "Zambia's Ecotourism Venture Clouded by Ecotroubles." 5 March 2002. ENS website accessed 9 March 2007. ^ "Victoria Falls in Zimbabwe, October 2017". Independent Travellers. independent-travellers.com. Retrieved April 7, 2018. Wikimedia Commons has media related to Victoria Falls. Wikivoyage has a travel guide for Victoria Falls. A useful list of further reading is included on the UNEP-WCMC website's page for Mosi-oa-Tunya. Zambia, officially the Republic of Zambia, is a landlocked country in south-central Africa. It neighbours the Democratic Republic of the Congo to the north, Tanzania to the north-east, Malawi to the east, Mozambique to the southeast, Zimbabwe and Botswana to the south, Namibia to the southwest, and Angola to the west. The capital city is Lusaka, located in the south-central part of Zambia. The population is concentrated mainly around Lusaka in the south and the Copperbelt Province to the northwest, the core economic hubs of the country. The Zambezi is the fourth-longest river in Africa, the longest east-flowing river in Africa and the largest flowing into the Indian Ocean from Africa. The area of its basin is 1,390,000 square kilometres (540,000 sq mi), slightly less than half of the Nile's. The 2,574-kilometre-long river (1,599 mi) rises in Zambia and flows through eastern Angola, along the north-eastern border of Namibia and the northern border of Botswana, then along the border between Zambia and Zimbabwe to Mozambique, where it crosses the country to empty into the Indian Ocean. The Lualaba River flows entirely within the eastern Democratic Republic of the Congo. It is the greatest river source (headstream) of the Congo River by volume of water. The Lualaba is 1,800 kilometres (1,100 mi) long. Its headwaters are in the country's far southeastern corner near Musofi and Lubumbashi in Katanga Province, next to Zambia. The Chambeshi River is the longest river source (headstream) of the Congo. The Victoria Falls Bridge crosses the Zambezi River just below the Victoria Falls and is built over the Second Gorge of the falls. As the river is the border between Zimbabwe and Zambia, the bridge links the two countries and has border posts on the approaches to both ends, at the towns of Victoria Falls, Zimbabwe and Livingstone, Zambia. Livingstone was, until 2012, the capital of the Southern Province of Zambia. Lying 10 km (6.2 mi) to the north of the Zambezi River, it is a tourism centre for the Victoria Falls and a border town with road and rail connections to Zimbabwe on the other side of the Victoria Falls. A historic British colonial city, its present population was estimated at 136,897 inhabitants at the 2010 census. It is named after David Livingstone, the British explorer and missionary who was the first European to explore the area. Victoria Falls is a town in the province of Matabeleland North, Zimbabwe. It lies on the southern bank of the Zambezi River at the western end of Victoria Falls themselves. According to the 2012 Population Census, the town had a population of 33,060. Mosi-oa-Tunya National Park, is a UNESCO World Heritage site that is home to one half of the Mosi-oa-Tunya — 'The Smoke Which Thunders' — known worldwide as Victoria Falls on the Zambezi River. The river forms the border between Zambia and Zimbabwe, so the falls are shared by the two countries, and the park is 'twin' to the Victoria Falls National Park on the Zimbabwean side. Kazungula is a small border town in the Southern Province of Zambia, lying on the north bank of the Zambezi River about 70 kilometres (45 mi) west of Livingstone. Southern Province is one of Zambia's ten provinces, and home to Zambia's premier tourist attraction, Mosi-oa-Tunya, shared with Zimbabwe. The centre of the province, the Southern Plateau, has the largest area of commercial farmland of any Zambian province, and produces most of the maize crop. Lumangwe Falls on the Kalungwishi River in northern Zambia is the largest waterfall wholly within that country, with a height of 30-40 m and a width of 160 m. The falls is 80 km from Mporokoso on the Kawambwa road. It has a similar depth of water falling over the edge to the Victoria Falls (Mosi-oa-Tunya) on the Zambezi for which it is frequently mistaken in photographs. The Old Drift Cemetery is a small burial site near the Zambezi river in modern-day Zambia. It includes the graves of early European settlers and visitors to nearby Victoria Falls who died of causes such as malaria and is located in Mosi-oa-Tunya National Park. Settlers eventually left the area for higher ground, where the town of Livingstone was formed. The Batoka Formation is a geological formation in the Zambezi valley in Botswana, Zambia and Zimbabwe. It is predominantly a volcanic unit comprising mainly basalts. It was formerly thought to contain sand stones containing the dinosaur Vulcanodon, however this was shown to be in error resulting from interpreting folding of the rocks as separate layers, with the sandstone layers actually being from the underlying Forest Sandstone. Kavango–Zambezi Transfrontier Conservation Area (KAZA) is situated in a region of Southern Africa where the international borders of five countries converge. It includes a major part of the Upper Zambezi River and Okavango basins and Delta, the Caprivi Strip of Namibia, the southeastern part of Angola, southwestern Zambia, the northern wildlands of Botswana and western Zimbabwe. The centre of this area is at the confluence of the Zambezi Chobe Rivers where the borders of Botswana, Namibia, Zambia and Zimbabwe meet. It incorporates Chobe National Park, Hwange National Park, and the Victoria Falls. Livingstone District is a district of Zambia, located in Southern Province. The capital lies at Livingstone, Zambia. As of the 2000 Zambian Census, the district had a population of 103,288 people. Its border with Zimbabwe is formed by the Zambezi River and Victoria Falls. Although most people live in Livingstone, other villages include Jinga Jinga in the north and Simonga in the southwest. The proposed Batoka Gorge Hydroelectric Power Station is a 1,600 megawatts (2,100,000 hp) hydroelectric power station, planned to be on the Zambezi River across the International border between Zambia and Zimbabwe.